Something is missing from my neighborhood gin and tonic bar, but I don’t know what it is. Sure, they output fishbowl size cocktails, with great attention to detail, but after downing one or two,an overwhelming sense of emptiness would swarm over me. Now I know why: the cocktails were not made by robots. Well fear not, because Roboexotica has been celebrating ‘Cocktailrobotics‘ since 1999. Each year, Roboexotica brings together the latest and greatest Cocktail Robots even with its own awards: ARCA – Annual Robot Cocktail Awards. This year the festival takes place December 6 – 9th in a former packing factory in Vienna. MELMACC (Mysterious Electrical Machine for Automated Cocktail Creation) is a cocktail mixing robot focussing on versatility and reliability. It boasts a wide selection of drinks, which can be ordered via a custom touchscreen interface. MELMACC has been in development as a hobby project since 2003, adding new features and improving existing ones constantly. The latest additions are a robot arm to add a straw and stir your drink and a mobile web interface so you can order a cocktail from your smartphone. The perfect combination of mechatronics and gluttony! Amalettomat creates wonderful crépes, automagically! And the dough contains alcohol! Alcohol for eating! Can you believe it? So what exactly are Cocktailrobotics? As robots have a growing number of different applications, the cases that involve interaction with an end-user are also growing. Progresses in the development of service-robots in the service of households and the elderly and also culinary proofs of concept, during the first decade of a new millenium [sic], have been very promising. While robots will assemble a car in the blink of an eye with no problem, during the first decade of the 21st century there was still very little effort made on broadly introducing robotics to the environment of a cocktail-bar. This is where since 1999 has been stepping in to attempt to create a competition of developing technologies and to introduce cocktail-robotics as an index for the integration of technological achievements in everyday life, and as a means of documenting the creation of new interfaces for man-machine-interaction, a priori dedicated to hedonism! ROBOEXOTICA, and the pool of creative people that annually assembles to celebrate spirited robotics, are now responsible for new ideas on the topic year after year. We are not aiming to replace human bartenders with machines, instead we aspire to help shape a modern Cocktail culture by highlighting new possibilites [sic] to enrich the experience of having a Cocktail. The ROBOEXOTICA tries to establish worldwide contacts with developers of cocktail-robotics and to function as an international platform for anybody interested in the topic. 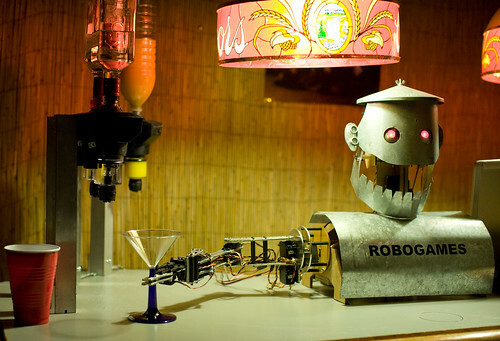 Serving Cocktails: robots capable of delivering a pre-prepared mixed drink to a patron. Mixing Cocktails: robots preparing a mixed Cocktail. Bartending Conversation, Interaction: robot that exhibit interaction/conversation skills befitting a Cocktail Bar situation. Fire+Smoke / Smoking Culture: robots that exhibit Fire and/or Smoke art fitting for a Cocktail environment. Or be helpful in the ritual of smoking cigars, cigarettes, etc. Other Achievements in the Sector of Cocktail Culture: Carte blanche – convince us your contraption has anything to do with either Cocktails or Robots!